Laura Cohen, 25, laces up her quad skates before a practice for the Snake Pit Derby Dames at Skate Plaza last Thursday. Laura Cohen admits that it might seem like she has multiple personalities. One part likes to shop at farmers’ markets, practice Yoga, write lyrics, and discuss mythologist Joseph Campbell. The other part of her is raw, rowdy, and socially rasping. It’s a side that craves intensity and adrenaline. This side, she attributes to her Viking heritage, something she doesn’t apologize for; each is equally part of who she is. She was born and raised in the Windy City. But her nomadic side has carried her from North Carolina to Hawaii and, most recently, Coeur d’Alene, where she moved for an executive’s assistant job at Quest Minerals Consulting in December 2012. Moving here, she didn’t know anyone except for her boss, John Ryan, the CEO of Quest Minerals Consulting. Her education is in art and wilderness therapy, but when Ryan offered her a position in Coeur d’Alene, she couldn’t say “no” to a new adventure. “I live in the gray areas,” said Cohen. She’s determined to get to know people. In January, she saw a flier for roller derby that sparked her interest. Squeezing on a pair of quad skates, she headed for the center of the track. It was her first introduction to the Snake Pit Roller Derby Dames at Skate Plaza in front of 30 of its members. The only caveat was that she’d never skated. “I’m a warrior on wheels now,” said Cohen. Something sacred, even primitive, a side of her that’s always existed, clicked. They invited her to play on the team. After undergoing rigorous training and a written test, Cohen graduated from the “fresh meat” training program, and will soon play her first “bout,” a roller derby match. Meeting for practice every Thursday and Sunday, the Snake Pit Roller Derby Dames are divided into smaller teams: the Diamondback Girls, the Hissfits, and the all-star team, the Venomous Vixens. Gaining momentum, the group competes across the Northwest, from Spokane to Seattle. The sport is predominately played by women, although men’s derby teams are sprouting up across the western world, particularly in the U.S. and Australia. Becoming popular during the Great Depression, roller derby was originally spearheaded by women as a spectator sport with a strong emphasis on entertainment. In the background, men had secondary roles as coaches and referees. ‘Derby couture’ means every player gets to create an alter ego, a character born of imagination, with a different name, style and personality. Derby, for many women like Cohen, unleashes the unknown. Cohen says they’re a tribe. As such, they reach out to the community as well. On March 9, the Snake Pit Roller Derby Dames plunged into Lake Coeur d’Alene as an effort to raise money for the Special Olympics. The team crosses generations and stereotypes, but many of Cohen’s teammates are mothers. “I saw this hard hitter one day at a match, and then she was rocking her little baby,” said Cohen. First a player must overcome the fear of getting hurt, says Cohen. Then it’s all about learning the technical skills and the rules of a sport that most do not grow up watching or playing. “I just want to be that unstoppable person,” said Cohen. Laura Cohen, left, races her own teammates on Thursday leading up to the St. Patrick’s Day match, “Hit Me I’m Irish,” which was held Sunday at Skate Plaza. Roller derby is a competitive contact sport, played between two teams of five players each on a circular track traveling counter-clockwise. 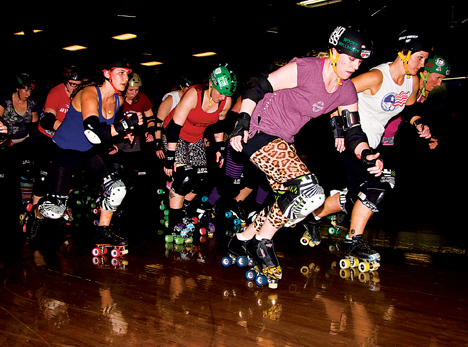 The two main positions in roller derby are blockers and jammers. Jammers break through the pack and score points by skating past the opposing team. “Whipping means pulling or pushing the jammers, and the jam is over either when it is called off by the lead jammer, or when a set period of time is reached, such as two minutes,” according to www.wisegeek.com. Derby is a place that leads Cohen to many other places. “It gives me a warrior mentality of not letting myself get down for any reason. People in derby skate past all the beliefs and limitations of something being hard, of not being good enough, and they do it,” said Cohen. In that place, alongside her teammates and opponents, Cohen sees herself. Her greatest passion is to always follow these adventures, whether she’s swimming in a waterfall in Costa Rica, snowshoeing at Fourth of July Pass, fire dancing, mushroom picking, feeling the breath of an Asian Elephant on her palms in India, or playing a piano in the back of a pickup truck with friends. She wants to once again teach wilderness and art therapy to children, adolescents and adults. Her dream is to build a healing center with a home and free-range farm in the wilderness. The refuge would be a place of permanence, dedicated to the many levels of one’s healing. It’s a dream she’s always, in some way, working toward. In fact, this weekend she’s headed south, through the undulating hills of the Palouse, in search of what could be that very place. It’ll be a rest stop, a quiet corner in a chaotic world, where anyone close enough to the silence can listen to the whispering rights of passage.